Did you know there are over 46,000 WordPress plugins available? Crazy! With plugins being a quick and easy way to add extra functionality to your website, it’s no wonder there are endless blog posts telling you all about the top 10 (or more) plugins you should have. While those posts are great, this one will be a little different. The purpose of this post isn’t to say that you should have all 4 of these. Instead, these are some of our favorite plugins we think you should know about in case you’re ready to add a little extra functionality to your creative business website. Let’s dive in and talk about 4 WordPress plugins that will help level up your creative business website. One of the most important things for your blog or business is by far your brand. It’s the first impression that not only all current readers, clients, and customers get but also the first impression that potential readers, clients, and customers will get of you and what you do. Your visual identity can work powerfully to attract the right to your brand and help boost your blog or business, or it can do the exact opposite. Kory here! The fact that your brand can have such a big influence on the success of your blog or business is the exact reason that people spend so much time trying to figure this stuff out – either on their own or by working with a professional. 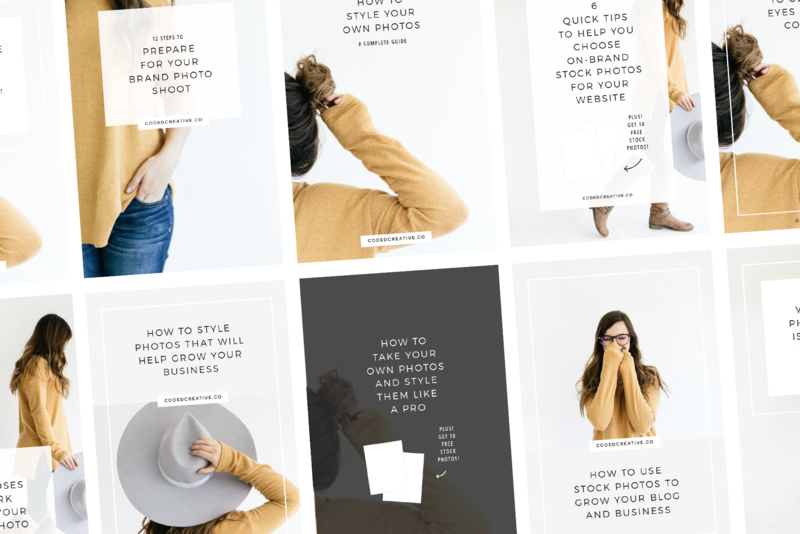 However, before you can even dive in to start rebranding your blog or business, you have to consider whether or not it’s actually time to take that big leap to begin with. 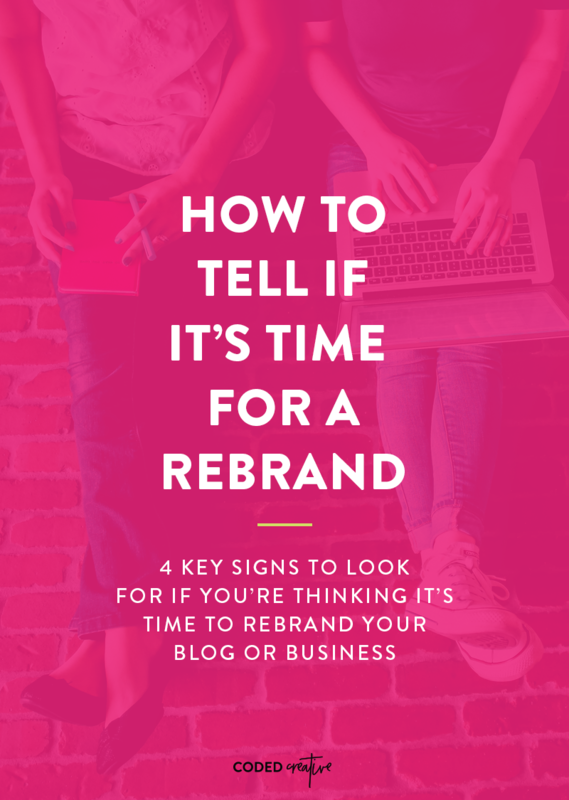 Since it’s hard to figure out whether you’re wanting to rebrand because people are making you feel like it’s something you have to do or if you’re thinking about hiring a professional because you know it’s the right time for your blog or business, today I’m going to break down 4 key signs to look for so you can know for sure it’s time to rebrand your blog or business. The most obvious way to tell if it’s time for a major rebrand for your business is if you’re going to be offering totally different services. If you’re adding new services that are complementary to what you already do, it’s not necessarily as important to rebrand because you’re likely targeting the same potential clients / customers. However, if you’re going to be completely cutting out what you’ve already been doing, it’s certainly time to rebrand. Preparing to launch a new blog or business is super exciting. There are so many things to consider and the possibility for what the future holds is enough to bring anyone jumping out of bed in the morning with excitement to get started. Well luckily, there’s one thing that’s easy to set up that will check one thing off your to-do list. And an added bonus is that it can start benefiting you right away, before you’ve even launched! That is setting up a Coming Soon page to collect email addresses before you launch! 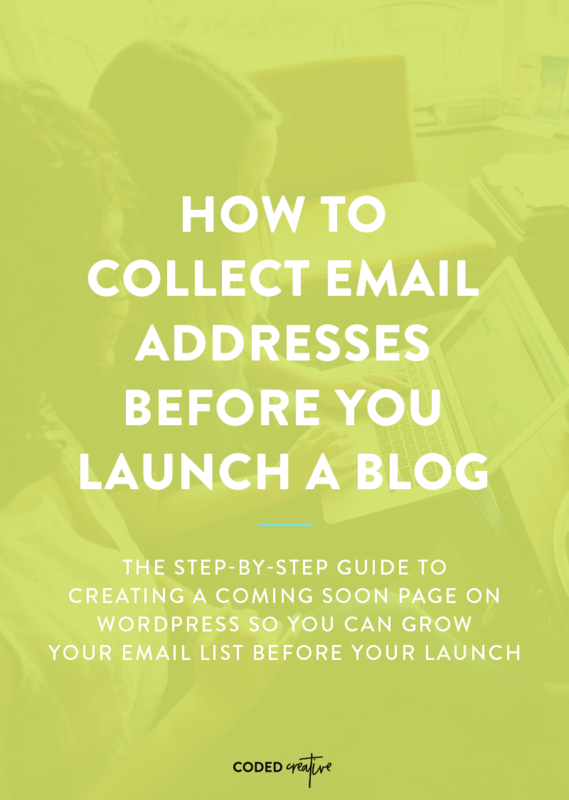 I’m sure if you’ve done research on getting your new blog off to a good start, that you’ve read about the importance of email lists. Your list gives you direct access to the people who most enjoy what you do. It’s a place to build community. And it’s a place to build your following into something more. 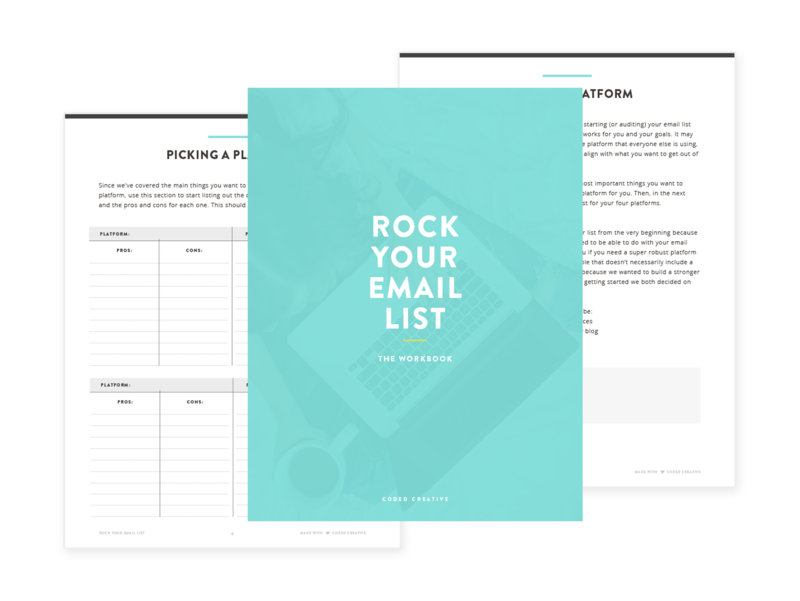 We started building our list before our the of Coded Creative and had over 100 people to email directly on launch day! As you’d imagine, we got a much warmer welcome than we would have if we’d had a list of 0. So today we’re going to help you set up a Coming Soon page to collect email addresses, similar to the one we had when we launched. Our final product will look like the image below, but don’t worry, you’ll be able to customize it to fit your brand. 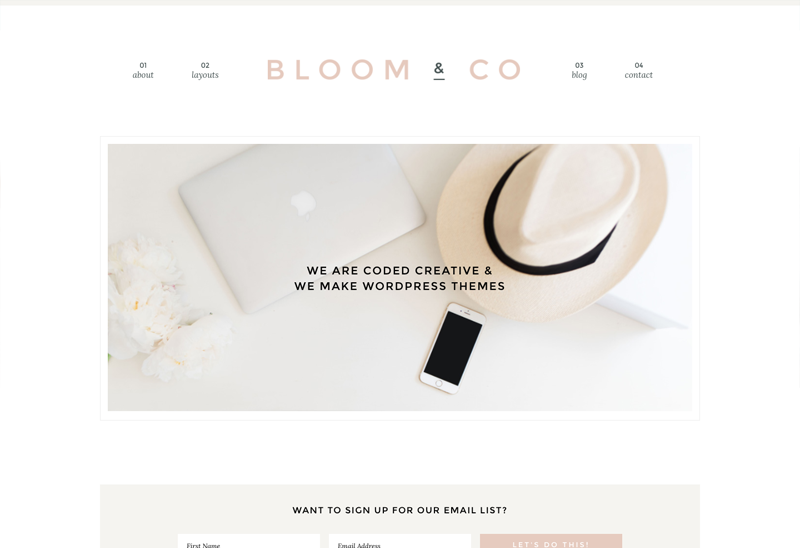 One of the most exciting things you can do for your blog / business is get a new design. Trust us, we’ve both spent lots of hours on the edge of our seat while working on our own sites. There’s something about having that new look that makes us feel inspired and ready to go after our goals all over again. Kory here! Even though it’s really exciting to get a new look, there are a few things that you’ll want to consider before just diving right in. 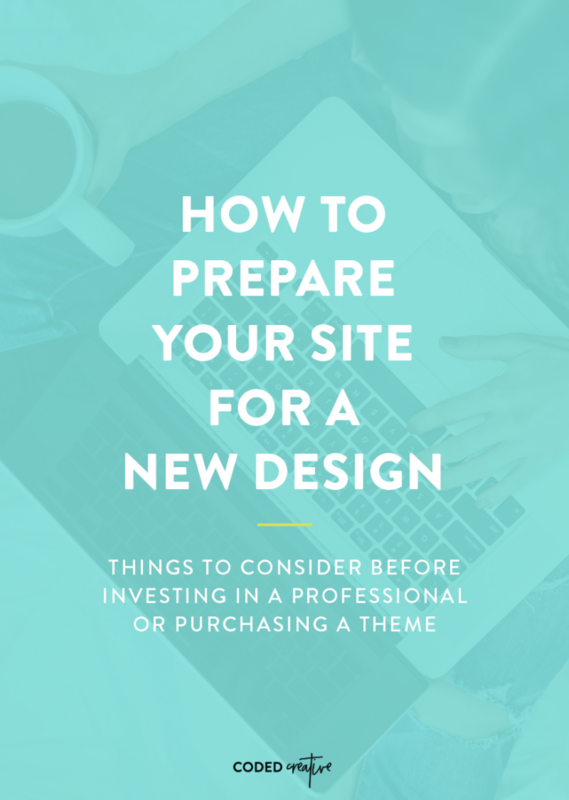 It’s not quite as fun to spend time thinking about these things, but stopping to prepare will help you make sure that you really need a new design and aren’t just getting one because you feel like you should. It’s also a good reminder that getting a new design isn’t necessarily a quick or easy process. Since you’re investing money, you want to make sure that you’re really intentional with your decisions and getting something that’s not just visually pleasing but will also help with your goals. 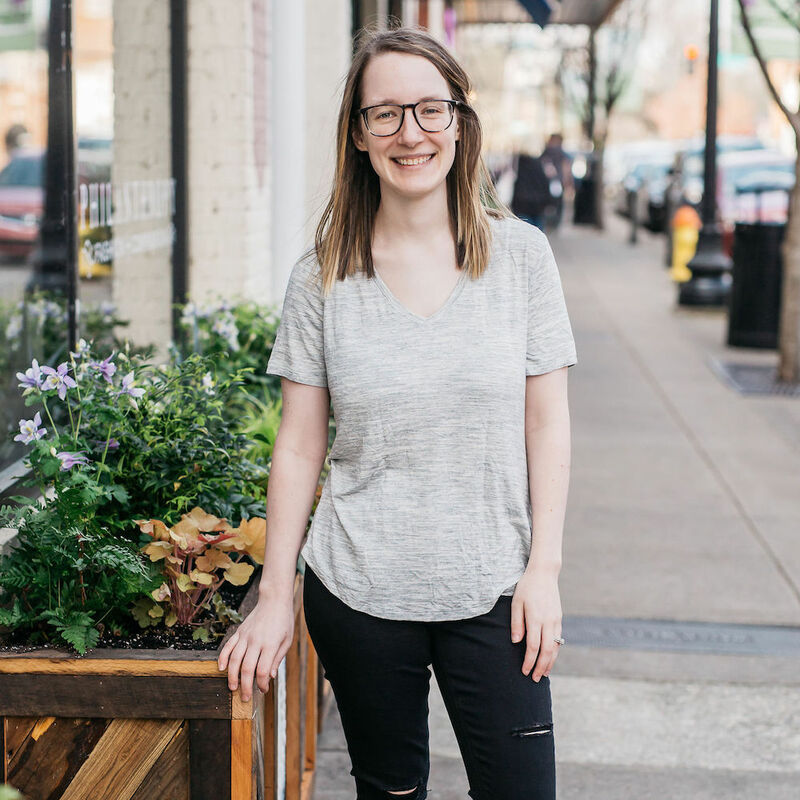 I'm Kory, the color and design loving gal behind Coded Creative. I'm ready and excited to help you create a beautiful and strategic design for your blog and business. Join the Coded Creative community! Looking for a new theme? Let me help you choose the right one!